Great concept, with superb sound and implementation. If you´re ready to spend £500 on improving your studio, spend it on Liquid Mix. Stunning sound. Powerful. Vast collection of emulations. Standardised GUI can cause some confusion. Cryptic emulation names. The Liquid Mix hardware is desktop-friendly. Real hardware names aren't used here. Controls absent from the emulated hardware aren't here either. In the ongoing development race between plug-ins and computers, it's always the hardware that blinks first. The faster computers get, the more complex the plug-ins become and the more of them we run on our machines. This goes on until we start to be hindered by slowdowns, crashes and so many frozen tracks that it becomes almost impossible to turn a beloved eight-bar loop into a complete song. It's hardly surprising, then, that DSP cards such as the Universal Audio UAD-1 and TC Electronic PowerCore have become so popular. These offer additional processing power, and their plug-ins arguably sound better than native equivalents. It's this DSP card market that Focusrite's Liquid Mix is coming into, but it's doing so with a twist. Unlike the aforementioned systems, this new Mac-only offering (PC support is on the way) doubles as a controller and a DSP box. What's more, it 'only' offers compression and EQ, but when you consider that these are 60 convolution-based recreations of some of the finest outboard units in recording history, this is clearly more of a feature than a limitation. Installation is a breeze - you simply install the software and plug the Liquid Mix into a spare FireWire port. To use it on a track, you just have to select it from your plug-ins folder. Liquid Mix supports up to 32 mono channels (16 stereo channels) and enables you to use one compressor and one EQ per channel, so the maximum plug-in count is 64. It should be pointed out that this is at 44.1/48kHz - as you push the resolution up, track counts drop (you can use eight mono at 96kHz and two mono at 192kHz). A forthcoming expansion card will increase the plug-in count at higher resolutions, though it won't increase the maximum number of addressable channels. Just to ensure that Focusrite aren't trying to kid users with their specifications we loaded up some of the compressors and placed them over a few tracks - and the Liquid Mix really can handle as many channels as it's supposed to and you can indeed apply compression and EQ to them all. One of the major problems with the UAD-1 and PowerCore products has always been their latency - this can make live playing of synth patches impossible if you have one of their plug-ins inserted into the same track. Liquid Mix does have some latency (with some presets adding a little more than others), but it isn't as noticeable as on some similar devices, and you can happily play patterns and riffs over your project with it engaged. Of course, another limitation of the PowerCore and the UAD-1 - and also of SSL's Duende, in fact - is that none of them offers any knobs to play with. You can tweak their plug-ins using your favourite hardware controller, but with Liquid Mix, you have all the controls you need right out of the box. What's more, they're incredibly clear and well-presented; as well as a panel of knobs, you get dedicated buttons and even an LCD display. The software GUI is where you'll find the real detail: the compression is on the left and the EQ on the right (the signal flow can be reversed at the push of a button). Each EQ instance can use up to seven bands, and you can even construct your own 'hybrid EQ' configurations by mixing and matching bands from different emulation models. If you've fallen for the bottom-end of one model and the upper ranges of another, you can marry them together with your own hybrid configuration. But what of the most important feature of the Liquid Mix - its sound? Well, to say it's sublime is no overstatement. In an era when most new music production enthusiasts haven't even seen any outboard hardware, it doesn't mean much to compare these emulations to the originals, but rest assured that the gear that inspired these models is legendary. In turn, the Liquid Mix offers a depth, warmth and level of character that's unrivalled in all but the finest and most expensive plug-ins. These aren't the kind of workhorse compressors and EQs that you strap over every channel - they're the ones you reach for to give your signals that special something, or to add a touch of professional class. To get the most from them, it will probably help to research what gear the pros use in the top studios, as the best hardware products tend to be associated with a specific task or a characteristic sound. So, should you shell out for a Liquid Mix? Is it worth it 'just' for EQ and compression? 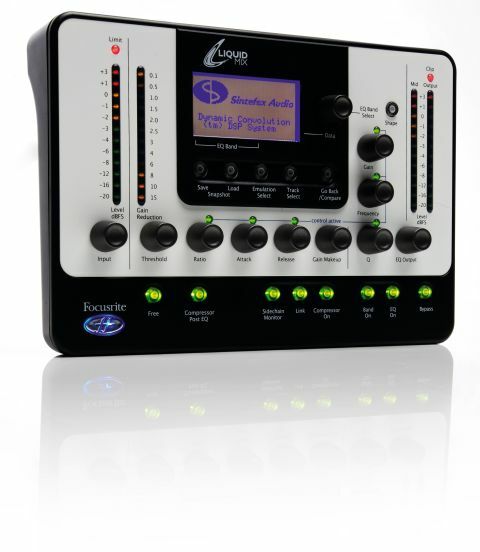 There are other excellent emulations out there - with the UAD-1, you even get recreations of the original interfaces - but when you consider its relatively low price and the sheer number of models it offers, Focusrite's box is utterly compelling.